Dana is a petite black female with white toes and blaze who was found as a stray near Ardmore, OK. Dana is estimated to be about 6-years-old. She was underweight and tested positive to the tick-borne disease Ehrlichia. Dana has not yet been tested with cats, but should not live with small dogs. 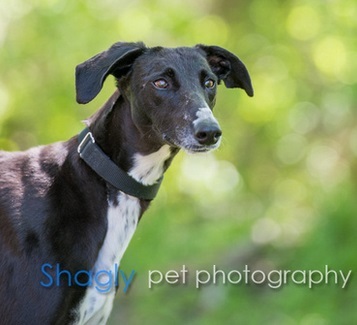 Dana is being treated for kidney disease, suspected to be related to the Ehrlichia Canis. Very slow improvement is being made. Dana's treatment continues, and bloodwork will be performed within the next 30 days to monitor her condition. Dana's bloodwork was pulled and is being evaluated along with her Protatek retesting. Dana's kidney values have much improved, and her Protatek titers are lowered. She has completed her medical procedures and is available to find her forever home! Dana's kidney function will need to be monitored semi-annually for the remainder of her life, and she is on a special kidney food and medication. Dana's condition is described as PLN - Protein-Losing Nephropathy - most likely as a result of her Ehrlichia Canis. 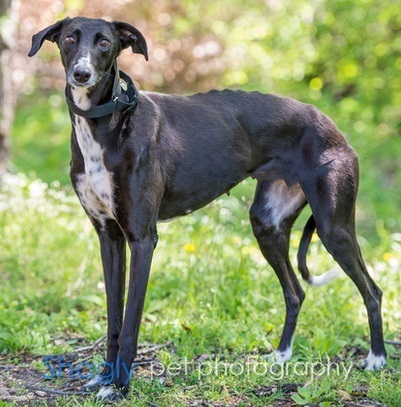 After a year in a loving forever home, Dana has returned to GALT due to owner illness. Talk about a long journey! Dana arrived a year ago, scared, shy and very thin. She gained weight and confidence. However, she was treated for Ehrlichia Canis and high kidney values for a very long time. Treatment and a special diet have improved her health to the point where she could be spayed and made available for adoption. Dana has turned into a happy play machine. Just under 50 pounds now, Dana comes with the most stunningly shiny black coat, bright white blaze and a full quarter of her tail is tipped in white. Dana LOVES toys. She will always grab a toy to exhibit her happiness at her people returning home. She loves to squeak and squawk toys. She loves to tear them apart. She loves to chew. She loves to run. If ever there were a dog to teach people how to live life to its fullest, it is Dana. Everything makes her happy, from food to toys, to walks , to runs, to bones, to treats, to belly rubs, to ear scratches. It is all good to Dana. When she is especially happy anticipating a meal, she chatters her teeth so loudly that she sounds like she is purring. No longer the frightened shy girl who cowered in the corner, now she even greeted strangers at the Irish festival. Dana wants her prospective family to know that her foster mom promises to send her with a large supply of her special kidney-diet-friendly cookies.